The club enjoys secure long-term formal leases on all bar one mile of the River Cowie; throughout the entire length of the River Carron and on the upper stretch of the River Bervie. It also enjoys exclusive migratory fish angling rights along the foreshore of Stonehaven Bay. By kind courtesy of the Dee District Salmon Fishery Board and Dee Trust, week-long electrofishing surveys now alternate annually in June on the main stem and tributaries of either the Cowie or the Carron at specific GSP-confirmed sites, by the Board and Trust biology staff with the keen assistance of club volunteers. This is hugely enjoyable and highly educational work, although often physically demanding - have YOU ever tried to count and measure a trayful of sedated fingerlings and parr whilst being simultaneously chewed alive by a zillion ravenous Scottish midges?!?! These surveys are slowly unravelling the secrets of our spawning and nursery areas and providing sound data on the ongoing state of health of the juvenile salmon and seatrout of these rivers, and the condition of their vital habitat. The river conveners also attend to general habitat maintenance, only requiring committee authorisation in the event of major work, ie tasks which may require formal planning permission etc. Any club member wishing to assist in these surveys is most welcome to contact the Club Secretary for details. It should however be noted that many of the electrofishing sites are in remote and rather difficult terrain and a reasonable degree of physical fitness is required. The discovery of just how many parr and fingerlings the tiniest dribble of a tributary can sustain, is more than sufficient reward for the sweat lost. •	Our rivers are classified as Category 3 and therefore all salmon must be released back into the river. 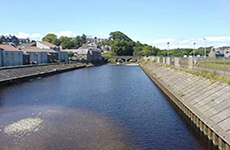 •	Due to the Stonehaven Flood Prevention works there will be disruption to the fishing on the River Carron over the next couple of years. •	Allochie Lochan is currently undergoing upgrades to its habitat and meantime is not being stocked.